Paintings of small racing sail boats are rare, they are elusive subjects. Michael McNamara, an exceptional sailor, sail maker, sailing coach, asked for a study like this one as a gift for his Father and Mother to remind them of their sons learning to race sail boats. I’m honoured to say Mike is a special friend of many years. Mike and his brother used to develop their skills in Grimsby Dock. Here they are sailing together in their favourite boat an ‘Albacore’ with Mike’s earlier Alb’ in the background. 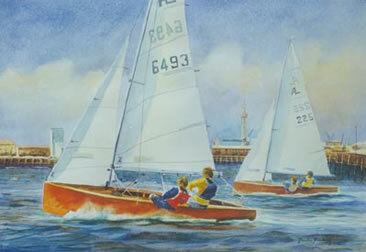 Mike ‘Mac’ went on to win more national and world championships than any other small boat sailor in Britain and owns a very successful sail making business (McNamara Sails) based in Norfolk, England.